A lot of people have asked why a Z-class tram was chosen for the Queen’s tram ride (rather than Melbourne’s traditional and iconic W-class, for instance). W and A-class trams don’t have handrails in the middle of the doorways, which can be a big help for older people. B-class trams do, but they may not have wanted to take a high-capacity tram (or two; they had a spare) out of service for this event. C and D class trams are low-floor, and have few handles — this would have been easier at the Federation Square platform stop, but perhaps not where the Queen alighted near Government House, where there is no platform. A, B, C, D, W, Z… which type of tram is which? Over time the tram fleet needs to switch to low-floor vehicles, and more tram stops need to be accessible. 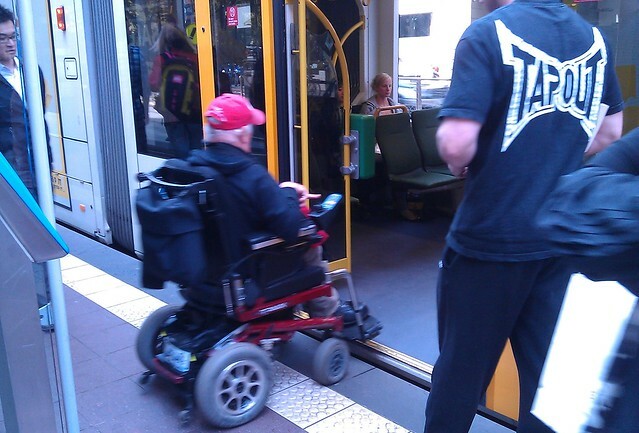 It does matter for the mobility of those in wheelchairs. As these roll out, they will be able to use more of the tram system. After all, some parts of Melbourne are most easily reached by tram (including the hospital precinct, which unfortunately and ironically, has no accessible trams serving it at all). No-step boarding is also faster for able-bodied people, and those using shopping jeeps and prams. Update Monday morning: There also seems to be some talk that a high-floor tram was requested to ensure more of the crowd could see the Queen at the window as it travelled along. I live in the city and travel on trams regularly. I rarely ever see anyone frank their ticket or swipe the Myki pad. You must be going broke. If you locked people in a cage to get on a tram making them swipe before they could go into the cage – then you would get paid. You can make singlefile cages that are as long as a tram. Where there are big stops make the cages larger. A conductor wouldn’t be successful when the trams are as full as they are. Or have an infra ray light that shows up every ticket on each client that hasn’t franked – now that would be fun! Or have conductors at all the main stops and get each person to frank before they get on the tram. What are they going to do for all those tramstops on roads like Sydney Rd and High St where there’s just no space for a superstop? They could take a few parking spots. Take at look at Whitehorse Rd for example. I’ve been hearing about trams in Europe that don’t need platforms – inside the door is a ramp that goes down to ground level. That would save building all those platform stops. @Alexander, in Sydney rd etc the footpath will go all the way out to the tram tracks, cars will follow the trams through the stops, and bicycles will go up and over the tram stop, just like they are going to be doing in Swanston St from late November. @Alexander in Docklands they have a handful of low-floor stops where the road is raised to the height of the tram doors, so the passenger waiting area is still on the footpath but the trams remain accessible. This may be an option for Sydney Rd – the clearways would need to be made permanent though.